One of the first steps that must be taken with the goal of developing an ADA accessible website is to know what the issues are. During a Website Accessibility Audit, we use our auditing tools and manually perform a page-by-page audit on your website using the same assistive technologies those with disabilities use. We utilize the WCAG 2.0 Level AA standards which are required for both ADA and Section 504/508. Provide a detailed Accessibility Audit Report outlining audit findings which will include all areas that have Errors, Warnings, and Manual Reviews required and make recommendations on how to correct these. For websites that have changes in their content on a regular basis, our Accessibility Assurance Program will ensure your website stays accessible. Most all businesses are required to have an accessible website to meet the ADA requirements. Schools, businesses and government agencies or organization who receive federal funding and must be compliant with Section 508. An Accessibility Audit should be completed when your goal is to have your website remediated by your team or ours. It is necessary to have the audit completed in order to pinpoint the errors. A manual audit will identify the errors, warnings, and notices. If you have a development team who will want to perform the remediations, the Accessibility Report will give them the pages the errors are on, the level of severity and show the WCAG standard. Depending on how versed your team is in implementing the remediations, optionally, we can also provide the necessary coding needed to perform the remediations. If you do not have a team who cannot implement the needed remediations, our team of remediators is available. Sometimes, it makes more economic sense to have a new accessible website developed rather than trying to fixing extensive errors. We can make the recommendation once the audit is complete and can handle your new web development from start to finish working closely with you and your team. You will receive a comprehensive, well-organized Accessibility Report your team can utilize for making the needed changes on your website. We will supply a sample Accessibility Statement you can modify for your business and place on your website. A sample of form giving users a method of contacting you to file a complaint regarding any accessibility issue. Schedule a convenient time to discuss your needs. We will review your goals with you and determine if an Accessibility Audit is the best solution for your business as well as the best options for remediation and ongoing methods of keeping your website accessible. Schedule a convenient time to talk with us. We will review your goals with you and determine if an Accessibility Audit is the best solution for your business as well as the best options for remediation and ongoing methods of keeping your website accessible. Documents on your accessible website must also be accessible or offer an alternative method of delivery. What types of documents can be remediated? The most common documents shared on the Internet are PDFs, Word documents, PowerPoint presentations, and Excel spreadsheets. We provide remediation services for these types of documents. Remediation services are available from GetADAAccessible.com to assist you in converting documents into compliant sources for your website. What does it cost to have Accessible Documents? The cost to either remediate or create accessible documents is dependent on a few things. The type of document and if it’s available in its narrative format. For example, if a PDF was originally created in Word, the Word document is available. The complexity of the document. We separate documents into two complexities: Simple and Complex. Simple being text and images. A complex document could be an employment application or other such documents. Schedule a convenient time to discuss current documents you provide on your website, and how future documents will be made accessible. Our Accessibility Assurance Program takes the worry out of your accessibility compliance you worked so hard to achieve. We keep tabs on all the changes of your website, and make the needed accessibility adjustments or alter you for any needed adjustments if you’d rather do it yourself. Depending upon your resources, you may find that our Accessibility Assurance Program is the best option to keep your website in compliance, so you never have to be concerned if what you are adding is compliant for the WCAG 2.0 or Section 508 under Title II of the ADA standards. Take the worry out of keeping your website accessible. Contact us to get a plan started. If you are adding new content such as pictures, text, events links, documents or any other new content, there are guidelines to be followed to ensure your website remains accessible. Training those who update your website or develop the documents, PDFs or other resources for our website is a must. 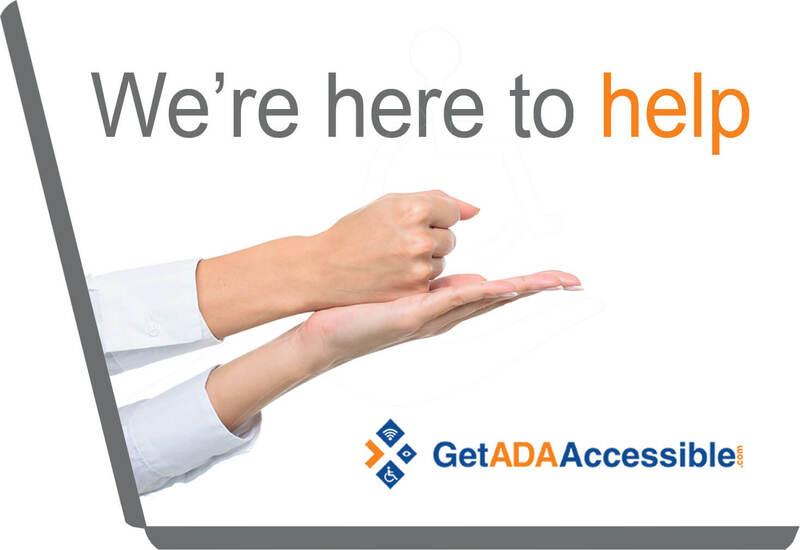 Get ADA Accessible can help you get the proper training. Contact us to learn more. Everyone should have the Internet available to them not just because it’s a legal requirement because in today’s world, the Internet is such a large portion of our daily living. This is our core belief and should be yours as well. Accessible Framework: Your website will be built in accordance with WCAG 2.0 Guidelines for accessibility. Additionally, we take all other web standards into consideration as well such as Search Engine Optimization (SEO), 3 click rule, and an easy to use content management system so you can update your website from any computer that has an Internet connection. To find out how we can help you develop an ADA compliant website using WCAG 2.0 Guidelines, contact us. We’ll let you know what can be accomplished with your current website. Your goal and ours is to have a fully accessible website. We work with you and your team to determine the best path to take on the road to accessibility. Our team of accessibility experts is here to help you every step of the way. You’ll have confidence in knowing your website will meet the WCAG 2.0 standards that are used for Section 508 / 504 of the Rehabilitation Act and as a standard for ADA web accessibility. Accessibility Website Audit – A website accessibility audit is always the first step. We can help you determine what level of auditing fits best. Website Audit Reporting – there are different levels of audits and reports. We will work with you to ascertain what is best. Website Accessibility Remediation – We can perform the necessary edits to your website code and color contrasts as well as provide an Accessibility Statement and a way for your users to submit a complaint. Document Accessibility – Word documents, PDFs, and other printed materials on your website must also be accessible. We will work with you to determine if your documents are accessible. We offer remediation of your documents and training for your team to create newly accessible documents. Website Accessibility Training – Anyone who will be adding new content to your website after it has been made accessible should understand what is required to maintain the accessibility level. Recorded and written training is available for your staff and team. Accessibility Assurance Program – Take the worry out of remaining accessible. Our team will handle your website and ensure new content being added is accessible. Website Monitoring tracks the changes made on your website and gives peace-of-mind.